Want to get this guide as a FREE printable pdf? Just subscribe below and we’ll send it straight to your inbox! We decided to make a long weekend out of it by hiking from Aspen on a Friday, staying the night in Crested Butte, and then hiking back to Aspen the following day and spending a night in Carbondale on the way home. Despite this hike’s popularity, we found very little on the web in the way of the logistical information needed to make something like this work. Don’t worry, we fumbled through the practicalities so you don’t have to! Below you’ll find everything you need to know in order to tackle this amazing adventure yourself. 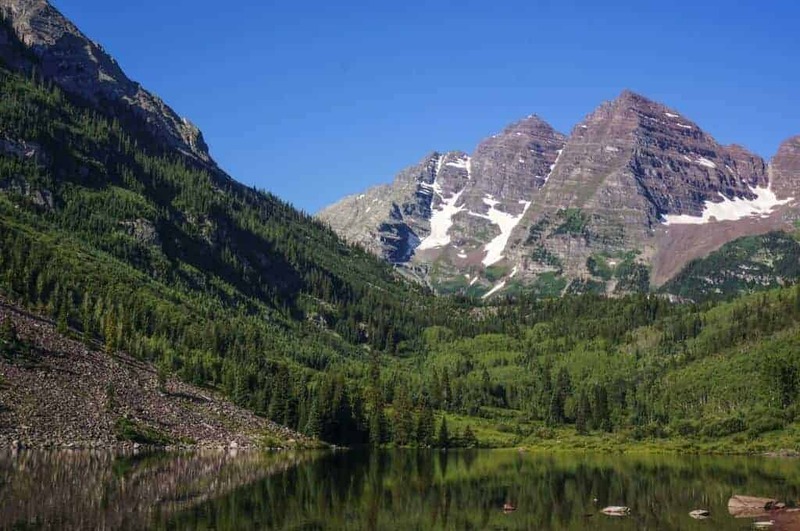 Start your hike at the beautiful Maroon Bells! At just over 10 miles, this is the more popular route. The trail starts at the iconic Maroon Bells recreation area and crosses over-you guessed it-West Maroon Pass, before threading its way through a wildflower-studded valley towards Crested Butte. The upsides of this hike are that it is the shortest option, the wildflowers are truly stunning, and it offers great mountain views from the top of the pass. The downsides are that it is more crowded, parking at the trailhead is nearly impossible, and from Aspen it requires more uphill walking (about 3,000 feet over the first seven miles). The map below shows the route and you can use this link to open it in a new window. As always, this map isn’t intended to be used in the backcountry – only to provide you with a general overview of the hike. Be sure you’re carrying a copy of National Geographic Trails Illustrated #128 and that you know how to use it! We chose to hike the West Maroon route both directions, but we were able to dig up some information about East Maroon in our research. At about 14 miles long, this route sees less traffic than West Maroon. You can start this hike either at the West Maroon trailhead, or down the road at the East Portal trailhead. Either way, look for signs that point you towards Copper Lake. The pros of this route include less crowds, easier hiking, and lovely views of Emerald Lake, Copper Lake, and Pyramid Peak. Cons include more mileage, having to shuttle back to the West Maroon Trailhead to pick up your car at the finish, and heavy equestrian use (maybe not a con for you, but I don’t especially love navigating through tons of what the horses leave behind on the trail). Heads up-Both trails require multiple stream crossings. In the first week of August, we found these to be pretty easy with water shoes and hiking poles, but earlier in the season the water levels are higher and the currents faster. We started our hike in Aspen, and our guide is written from that perspective. If you choose to start in Crested Butte, this information will still be useful for you, just reverse it! Park at Maroon Bells: If you’re an early riser, plan on going mid-week, or are going late in the season, you can try to park at the trailhead. From the lots, simply walk up the road towards Maroon Lake to start the hike. Make sure to bring $10 cash for the overnight parking fee, paid at the entrance. Keep in mind that the road is closed to private vehicles from 8:00am-5:00pm, June through September. Park at Aspen Highlands and Take the Bus: This is what we opted to do after finding the Maroon Bells lots full. The Aspen Highlands Ski Area is located down the road back towards Aspen, and overnight parking on the lower levels of the garage is free if you get there before 8am. The bus costs $8 per person (return trips are free) and the first bus departs from Aspen Highlands at 8:05. The bus then runs both directions every 15-20 minutes until 5:00pm. We found this to be an easy and convenient option, but there are a few considerations to keep in mind. First, if you are a slower hiker and/or there are afternoon thunderstorms in the forecast, you may want to get an earlier start since the hike takes anywhere from 6-9 hours (we didn’t start hiking until about 8:30am). Additionally, be sure to schedule your pick-up on the Crested Butte side accordingly and make sure you’re back at Maroon Bells the next day by 5:00pm. Dogs are welcome on the bus. Park at Aspen Highlands and Take a Cab: This is a pricier option, but a great choice if you want to get an earlier start than the bus will allow. Once again, parking at Aspen Highlands is free before 8:00 am, and you don’t need to check in with the parking attendant or get any sort of ticket. Simply enter the lot and park on the lower levels. From there, arrange a cab to take you to the trailhead. Upon your return, hop on the bus for a free ride back to your car. If you are hiking from Crested Butte, there are some Aspen Highlands buses that will take you directly into downtown Aspen where you can enjoy a luxurious hotel stay or catch another bus to towns in the surrounding area. You can ask in the gift shop at Highlands for more information on the bus schedule. Use a Shuttle Service: There are two shuttle services (Dolly’s and Alpine) that will pick you up from the trailhead and bring you to your hotel in Crested Butte. Call and schedule a reservation in advance and they should be waiting for you at the trailhead. Pick-up’s typically cost about $20 per person. These services will also bring you to the trailhead from town in the morning. At the time of writing, Dolly’s Mountain Shuttles had a two-car system that ferried hikers on either side of the avalanche damage, so that hikers did not have to walk as far along the road. Hitch a Ride: Most people traveling on Gothic Road are friendly fellow hikers and mountain bikers who are more than happy to pick you up and take you into town. We ended up hitching a ride into Crested Butte, and we had a great experience. We recognized the women who picked us up from passing them on the trail, and they were so kind that they even dropped us at the door of our hotel! Obviously this is a less reliable and more adventurous option, but it is a common practice along this road that often leads to new friends and great conversations. 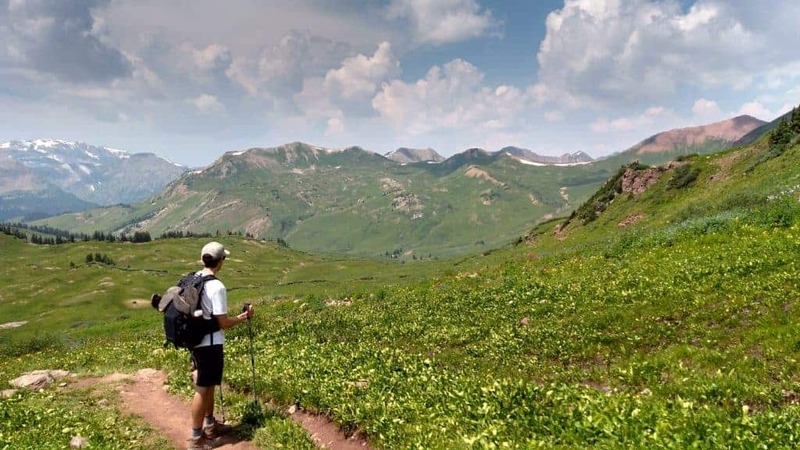 Ask Your Hotel: Several hotels in Crested Butte offer hiking packages that include shuttles to and from the trailhead. If you’re interested in that option, a quick search of local hotels yields plenty of options. Enjoying the views on the Crested Butte side. What if I only want to hike one way? We were lucky enough to have time to stay the night in Crested Butte and hike back to Aspen the next day, but not everyone has the time or energy to do that. Below are your options if you’re not able to hike the trail round-trip. Hire a Shuttle: Dolly’s and Alpine both offer shuttles between Aspen and Crested Butte, although they are not cheap (upwards of $300). However, if you split this across a big group of hikers, it wouldn’t be too bad. Rent a Car: There is a free bus that runs from Crested Butte to nearby Gunnison. In Gunnison, you can rent a car at any of the agencies near the airport. You can then drive to Aspen, pick up your actual car, then drop your rental at agencies near the Aspen airport. Obviously, you’ll need at least two drivers in order to make this work efficiently, since one of you will want to drive your car from the trailhead to the rental car agency so you don’t end up stranded there. Arrange a Ride or Shuttle Your Own Cars: Maybe there’s someone out there that really, really loves you or owes you in a big way. If that’s the case, that special person could pick you up from the trailhead in Crested Butte and drive you back to your car in Aspen. Or, if you’re part of a group that doesn’t mind a road trip, you could drive to one town, leave a car, and then drive back to the other one. This would be a good option if you have some podcasts you’ve been meaning to catch up on. How muddy was the trail? With all the recent rain, my group is concerned it’s too muddy to make the trek to Crested Butte from Maroon Bells. There were some very muddy sections of trail, especially on the Aspen side, when we hiked last weekend. That being said, it wasn’t anything that was too difficult to get around. I’m not sure how much rain they have gotten this week, but I’d be very surprised if it was too muddy to make the trip. I’d recommend giving the Aspen Ranger District a call at 970-925-3445 to get their thoughts. Hope that helps! We are planning on the hike over Labor Day actually on Labor Day. We are a little concerned about carrying enough water for the distance how did you handle that? Do you have any recommendations? I apologize this is the first time for us doing a long hike like this, however should we be concerned about unexpected wildlife and be prepared for that? Thank you, in advance, for your help. This has been great information. I would plan on carrying at least 2-3 liters of water per person for this hike. It is a long day and you want to be sure you have more than enough. A large 100oz CamelBak would also work well. As for the wildlife you shouldn’t have any major concerns outside of what you might expect on any normal hike. The area sees a fair amount of human traffic which tends to limit the wildlife. However, to be safe I always recommended talking loudly and making noise anytime you are in thick willows where animals might be surprised by you. Thanks for the tips on the parking situation in Aspen. Good idea to use the parking garage and taxi to the trailhead. Based on the other info I found online, I was skeptical of the overnight parking availability at the trailhead. You confirmed my fears and provided great solutions. Thanks! Looking forward to doing the round-trip trek on Monday-Tuesday this week! Thanks, Jordan! Glad our info was helpful and hope you enjoy the hike! We are planning to hike from Aspen to CB mid-week in mid-Sept. Curious how long the hike took you? We are regular and pretty speedy hikers in the PNW and will have been in Colorado a week at that point so should be fairly acclimatized. Thanks for any further insight. It took us about six hours to hike from Aspen to CB and about seven on the way back. Due to a spring avalanche, Gothic Road (the access road to the trailhead on the Crested Butte side) is impassible by vehicle about two miles from the start of the hike, so make sure to factor in some extra time for walking that section. There are also shuttles that can take you most of the way. It sounds like you guys are fit hikers, so we’d recommend planning for about six to eight hours. The fall colors should be lovely in mid-September! Enjoy your hike! Thanks so much for the info! Plan to do this the first week of Oct and am hoping to hike Aspen to CB then reverse the next day given the pricey ride back. With proper water, snacks and rest at a hotel in CB, this is probably do-able for a healthy hiker, correct? I’ve heard the Nordic Inn is a good place to stay…any recommendations? You’re right, weather permitting the return hike should be very doable for you as a healthy hiker. That is how we did it and it was great – especially since staying in a hotel means no tent so a lighter pack. As for places to stay in the CB we really like the hostel in town for a good budget option but we’ve also stayed at Elevation Hotel in Mt. Crested Butte which was nice. Thanks so much! I’ll check out the locations to stay and pick one that works best for me 🙂 Fingers crossed weather is gorgeous! Is East Fork trailhead the same place as Schofield Park? Some maps for Aspen to Crested Butte say it ends at East Fork TH, some say Schofield Park. You’re right, different maps use different names for the trailhead, but they are the same. Throughout your hike, make sure to stay on the West Maroon Trail, and it will end at a trailhead that is located on Schofield Pass Road. Thx. Great hike. Gothic Road is still blocked south of Emerald Lake, about 1 1/2 miles from trail head, but trail head is accessible by car via Paradise Basin Road, which intersects Gothic Road north of Emerald Lake and the snow pack, about 3/4 mile from trail head. Happy to hear you enjoyed the hike! Thanks for the helpful update. Hi there- is the trail from Aspen to CB clearly marked? Seeing a few reports that say there are unmarked forks, etc. Thanks! As far as I can remember, the trail was very well marked. If you pay attention at the junctions and stay on West Maroon the entire way, you should be just fine! Enjoy your hike!